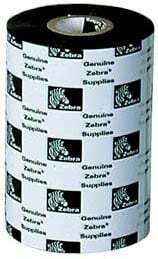 Zebra 5555 Wax-Resin - 8.66" x 1,476' - 5555 Enhanced Black Wax-Resin Ribbon. Compatible with Industrial Printers. Single ribbon. Used with polypropylene labels. Also available as a case (Part# 05555BK22045). The Zebra 05555BK22045-R is also known as ZEB-05555BK22045R	or 05555BK22045R	.